This year's Christmas break finally saw us going to the Olivine Wilderness. In spite of rain on 7 out of 9 days of the trip, we managed to time pit time in bivvy rocks and in the tent so well that we got to the Olivine Ice Plateau where we climbed Climax and Destiny and back out without getting wet once (apart from river crossings). Day 1: A good start to our trip: After two days of heavy rain, the flooded River Jordan had taken the road out, which forced us to park our car at Paradise and walk 12 km to Chinaman's Bluff. To Daley's Flat Hut from here. Day 2: From the hut to bushline above the Margaret Burn and onto the Barrier Range, which we traversed to Mt Watkins via Desperation Pass and Steffanson Peak. Descent to Derivation Neve. Day 3: Over Mt Gates into Blockade Stream. Day 4: Half a pit day and onto the Plateau. Day 5: Climb of Climax and Destiny Peak (2446 and 2411 m, respectively) and descent to Forgotten River Col to the Rock Bivvy. Day 6: Pit day at "Forgotten River Hotel" watching the rain. Day 7: Half a pit day and descent to the Forgotten/Olivine confluence, where we had to wait a night for the Forgotten to become crossable. Day 8: Horrible bush-bash up to the Olivine Ledge (pays to take the time to find good trails). 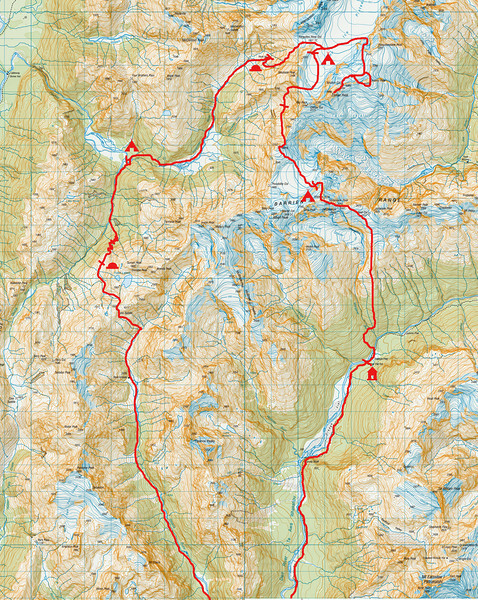 Day 9: Over Fohn Saddle and down the Beans Burn to the confluence with the dart, where we found ourselves lucky and got a jet boat ride across the dart and a car ride back down to our car at paradise. Party: Jaz Morris and Nina Dickerhof. Thanks to Geoff Spearpoint for advice on the route.